I have seen a few recipes for the Barefoot Contessa’s lemon chicken floating around the web recently and the recipe looked so good I had to make it. I adapted it a bit by using skinless chicken breasts and I used chicken broth instead of wine because that is what I had on hand. The dish was very simple to put together and it smelled amazing while it baked. I basted the chicken breasts a few times while they were in the oven so they would stay moist. The meat turned out really tender, moist, and so delicious. I really loved the lemon flavor. Both of my kids liked it and so did my husband. 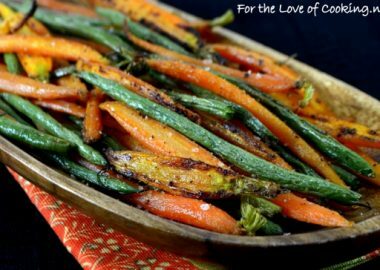 A quick and simple recipe – perfect for a weeknight! 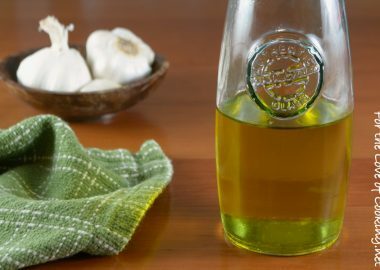 Heat the olive oil in a skillet over medium heat; add the minced garlic and cook, stirring constantly, for 1 minute, making sure not to burn the garlic. 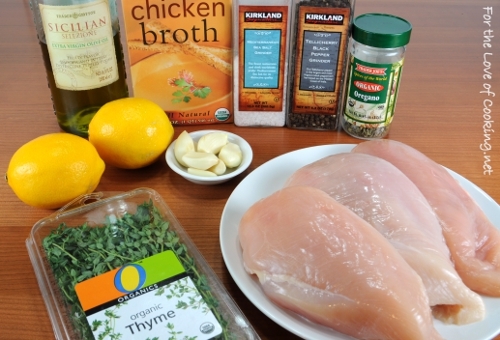 Add the chicken broth, lemon zest, lemon juice, oregano, and thyme leaves to the pan. Pour the mixture into the baking dish. Season both sides of the chicken breasts with sea salt and freshly cracked pepper, to taste. 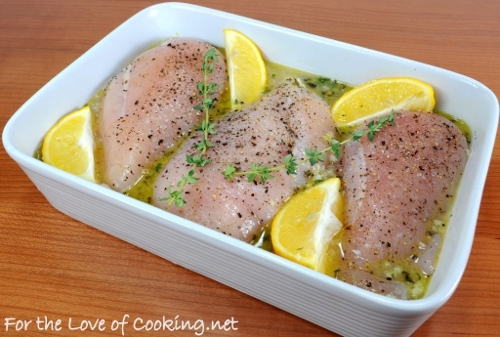 Place the chicken in the baking dish along with the lemon wedges and the two sprigs of thyme. « Welcome to the new website!! You have been in an awesome recipe roll lately. I cannot wait to make the last few things you have posted. I am so excited to say I have tried this recipe and it was so easy and delicious. I hope to find more recipe like this ! I have made this many times and never get tired of it! The lemons come out of the oven tasting so, so good. And that juice! Can’t go wrong with Ina Garten in my estimation. I will be enjoying this TONIGHT! It fits right in with my Weight Watchers points ! Thanks for posting. It looks so wonderful! I bet the flavors were just perfect. 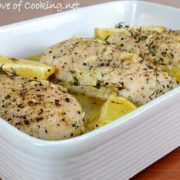 I love the lemon/thyme combination, will definitely be trying this soon! This look delicious, healthy, and EASY! Great recipe to kick off the new site! Lemon chicken is my FAV!!! Oh and I see you made the font bigger!!! YEAH. Catches my eye now! Love your new look, Pam. WordPress takes some getting used to but the effort will be worth it. 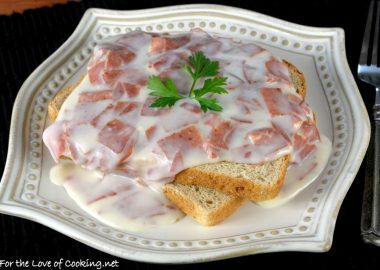 I have read so many good review of this recipe that I’m going to have to make it soon. We can always count on Ina. It’s funny you used skinless chicken breasts because I kept the skin on for appearance sake but we didn’t eat it. I may just rip off the skin next time before baking. Didn’t you just love the juices from the chicken. I poured them all over my cauliflower and chicken. 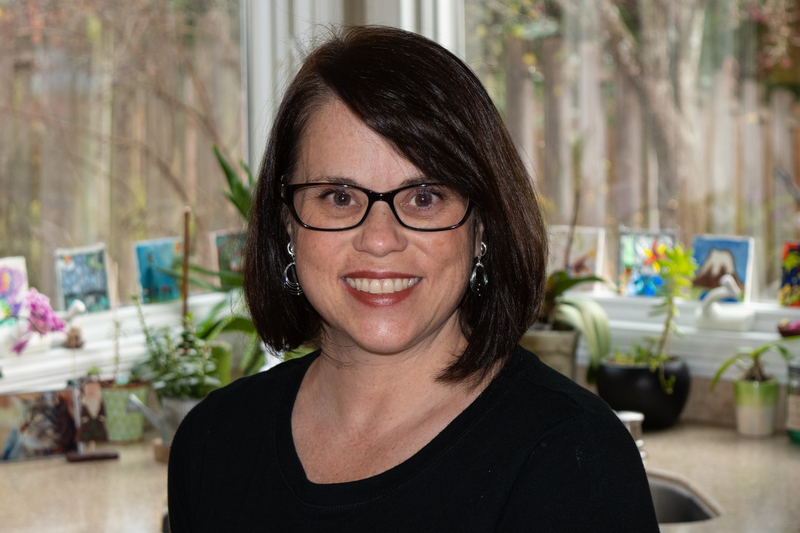 I am loving your new site and am inspired to make a switch at some point. It’s just so professional. 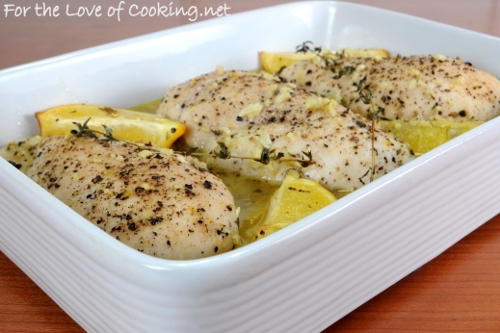 I used to make a similar lemon chicken dish that I loved. 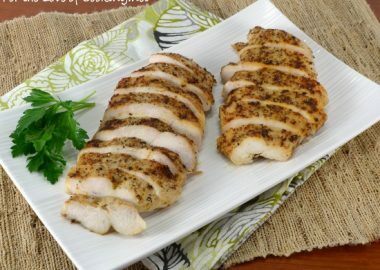 I going to try this recipe as I’m always on the look out for healthy delicious chicken dishes for dinner. Thanks! LOVE the new site. Love it!! Congrats! I have been searching the Internet for days trying to find healthy & delicious recipes with no luck… until today when I found your blog. I LOVE IT!!! I even shared with all my co-workers! That looks incredible!!!! Rachael Ray has a similar recipe but with rosemary and it’s to die for. I just yesterday bought some fresh thyme and I think I might need to make this with my leftover Thyme! gorgeous, and so clean and healthy. love this recipe! These sound wonderful! I think the best part when Norm comes home will be cooking again! If there’s one thing Ina does well, it’s simple but delicious chicken recipes (and everything else. She does everything else well too.) This sounds delicious! This chicken looks like something I need to fire up on the Egg! That bit of fire roasting will make them sing. This looks delicious. I like the fact that is a nice easy recipe. Weeknight recipes are much needed! I’ll be sure to try this soon since I have so many lemons to use up. it seems to me that thyme is a pretty under-used herb, and that’s too bad! I have a similar recipe. But instead of garlic, i use sliced onion. I use paprika instead of black pepper and add rosemary too. Either way, the combination of the broth, the lemon and the herbs is delicious!!! Two thumbs up. . . waaaay up!! 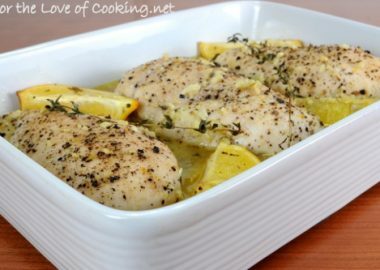 My gosh, there is just something about a good lemon chicken recipe… yumminess of chicken mixed with the acidic citrus tang… add some oregano like you did here or rosemary- something savory to add depth and i am done, hook and line and sinker, for the dish. I made this one night for dinner this week and it turned out so yummy 🙂 Thank you!!! This was excellent! Thank you for sharing. Oh, and I skipped cooking it in the oven. Just put everything in the pan and cooked it all in the oven. Delicious and sooo easy! This was great! Next time I will double the sauce and add a chicken breast! Thanks for another keeper! I absolutely love this chicken recipe Pam……I have made it several times and for company too and they loved it. I never had boneless skinless chicken breasts come out so moist and flavorful until I made your recipe. Thanks for sharing! Toiney, you can adjust the recipe to taste and you may like it. Sometimes some garlic is more potent than others which could account for the overly garlic flavor. You could thicken up the broth with some cornstarch and water or take some of the broth and mix cornstarch in it. For the color, you could put it under the broiler or brown it in the skillet that you use to cook the garlic in. everything’s so healthy thank you for this website keep it up!!! 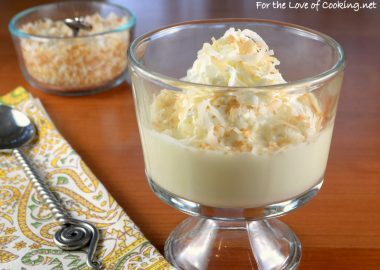 I’ve just tried this recipe and must say is utmost delicious!!! Thanks for sharing! Hi,i would like to know whats that green bottle u have on the picture,its hard for me to see what it is,id really appreciate it.thank you. I need to make this for 5 people. Do I need to add and adjust the recipe in any way? I would double the recipe to be safe. Leftovers would be tasty in a panini or soup. I tried this recipe last night and it was divine. 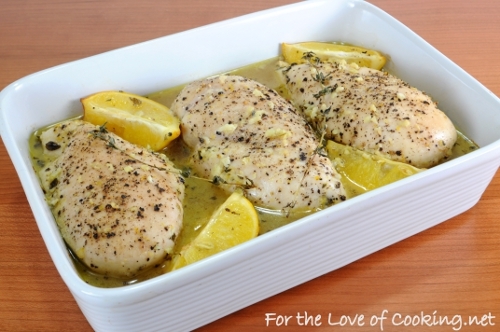 One question – would it be okay to cover the baking dish with foil, like a makeshift lid, so that the juices don’t splatter in the oven, or would this affect how the chicken is cooked? Thanks! I’m looking forward to trying your other recipes. I have the same question, and might try it covered. One thing for sure – the sauce will be thinner if covered, and I suspect the cooking time should be reduced. I just made this exactly as in the recipe today and it was really good. I am sorry, I am just now seeing this question. I am sure it would be fine to add tin foil to the top. Let me know how it turns out! I want to try this recipe but would like to know if I use dried thyme instead of fresh, would it be the same taste? Dried thyme would be fine. Does it need to be cpvered with foil paper or leave it inthe open? I made it without tin foil or a lid. Is it ok to make everything ahead of time–make in the morning, put the chicken in the baking dish raw with the sauce, keep it in the fridge for the day and then pop it in the oven to cook for dinner? I wouldn’t recommend it. The lemon will break down the meat and make it a bit mushy. Also, the lemon pith can become bitter and will ruin the flavor of the chicken. It only takes a few minutes to prep before you put it into the oven. This is one of the best chicken recipes I have EVER made. 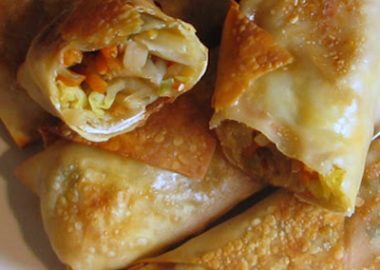 Super easy, and the leftovers are almost even better because it sits in all those delectable juices. Thank you for this! I used pre-minced garlic and all dried thyme and it was still delicious. I made this tonight and I was fantastic! Even my kids loved it. This is a delicious recipe! I took the suggestion of another reviewer. After I made the sauce and poured into the baking dish, I seasoned the chicken and lightly dredged it in flour. I browned it in the same pan that I had made the sauce — just a minute or two on each side. Then I put it in the baking pan with the sauce and baked as directed. The chicken was tender, juicy, and very tasty. This recipe is definitely on my “make often” list! I tested this recipe and it taste bland to me. the lemon flavour hardly seep into the chicken. NOTE to beginner : after 25 mins, the chicken breasts are thoroughly cooked through with not much juices left and if it stay in for 5 or 10 more mins, it will be too overcooked. I’ve made this several times. My 4 kids love it, which is always a bonus! Going to be trying it in foil packets on the grill tonight! I tried this a while ago during my daughters lacrosse season. I needed something easy. She and my husband loved it!! It is now in my recipe rotation!! Thanks for sharing!! Looks & sounds delicious. Will try this week. Thanks for posting. In the oven right now! Can’t wait! Just made this tonight for my family! Paired it with broccoli w/ cheese and a side salad. it was so yummy! The flavor of the lemon pairs well with the chicken. Loved it!!! I cut up and added bell peppers as well as a red onion. I found that there was no excess “pan sauce” and poured the mixed garlic, olive oil, chicken broth, lemon juice, etc over the chicken breasts before putting into the oven. Turned out delicious! Omg! This is so great. I’m glad you decided to share this recipe. I’m completely surprised on how amazing it came out. Thanks to Kim in md I used her broiler trick and it was delicious. Thanks Pam for this wonderful recipe. I made this last night and it was very good. I did not have any oregano and I thought it was still delicious. I made it with roasted red potatoes and green beans simmered in chicken stock and bacon. I will be making this again. Use safflower oil to cook garlic (higher heat oil), then I added shallots cook til translucent, then remove garlic and onions to baking dish. You have the skillet dirty anyways so brown the chicken. Turn up heat a touch and brown the chicken on both sides, add a touch more safflower oil if needed. Adding salt and pepper to taste, then set aside chicken to baking dish. The juices from the browned skinless chicken add alot of flavour to the sauce. Turn heat back down add olive oil and the rest of ingredients for sauce, simmer, then pour over chicken. Use a small baking dish so chicken is 3/4 covered with sauce… add a little water or more broth if need be (I used wine and broth), then no need for basting. 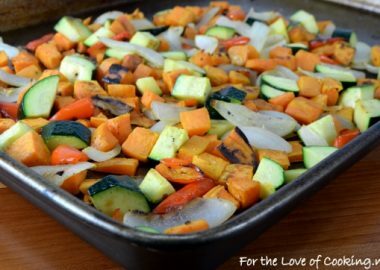 Serve with roasted vegetables (new potatoes quartered, bell pepper, carrots, tossed in olive oil and salt/pepper) on sprayed baking sheet. Add to oven 5-10 min after chicken (25-30 mins total). Then you can walk away for 30 mins and have cocktails on the patio. PS will add a couple teaspoons cornstarch disolved in warm water to skillet before finishing sauce next time. Will thicken sauce a bit while it bakes in oven. I also added a dash or two of poultry seasoning. It was yummy! Hello, I am new to the cooking world, so I have a question that may seem basic to many of you! I made the recipe this past week and my husband was happy with how it turned out! However, I did not do anything to the chicken while it was cooking. 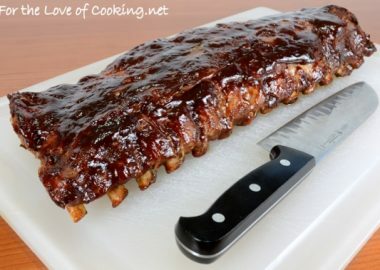 What do you recommend to use for basting? Thanks for the help! Baste with the liquid in the baking pan (chicken broth & lemon juice mixture) that the chicken in cooking in. I hope this helps. Hi! 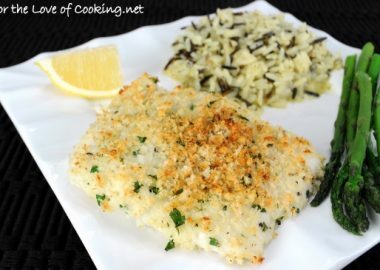 I really do love this recipe and have made it couple of times, however last time i made it, the garlic turned out blue-ish. Any idea what i did wrong? I’ve never had that happen before. I searched the internet and found this… hope it helps. Absolutely amazing! I followed this recipe exactly, and I cooked the chicken for 30 minutes. The chicken came out very moist and juicy! Made this last night with some linguine and it was delicious! Only thing I did different was add crushed red pepper along with the garlic in the oil. Oh I also added dried basil too. Dec will make again. Thanks. Love the NEW look; however, the PRINT button doesn’t seem to work!! Thanks for letting me know! I’ll have my designer look into it! This was great! I just wanted some chicken to put on my salads and this was perfect. I wanted the sauce to really stick to the chicken though so once it was done in the oven, I drained it into a saucepan, added a cornstarch slurry, and stirred over high heat until it thickened. Then I tossed it back with the chicken.